Your new African Violet has bloomed out and you’re wondering how to get new blossoms. Here’s how. 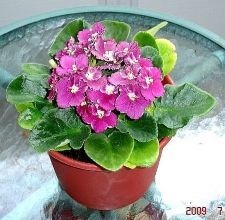 After your newly acquired African Violet has bloomed out, you will want to transplant it into a pot one size larger than the one in which it is in. Be sure that your new pot has adequate drainage and a saucer to catch any excess water. Use a top quality African Violet potting soil for optimum results. 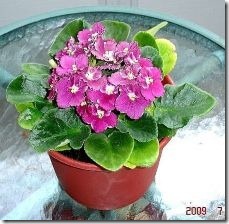 I use Miracle Gro African Violet Potting Soil and have had a lot of success with it. Lightly water your violet before transplanting to keep the root ball and soil intact. Place at least 1/2 inch of new soil into the bottom of the new pot. Gently tip the violet out of the old pot and place it into the new pot, taking care to support the leaves by sliding your index and third finger between the crown and the soil ball. Add sufficient soil around the existing root ball to anchor it firmly in the new pot, tamping down the soil firmly. Give the newly transplanted violet a through soaking, allowing excess water to drain away. Take care to keep the crown (center), and leaves dry. If you get water on the leaves, take a paper towel and gently blot the water away immediately to avoid rot spots. Place the violet 12 inches back from a window that receives morning sun, OR you can use a gro-lux plant light in any room (8-10 hours per day) to achieve the same results. Avoid afternoon sun as this can burn the plant. Fertilize your violet every two to three months with a top quality soluble African violet fertilizer. Watch your little beauties thrive and produce blossoms month after month. Allow your violet to rest occasionally for a month or two to keep it healthy and it will produce bigger and more plentiful blossoms. When you see another crown (center) form on the side of the main plant, it is time to divide and transplant the violet. Take a small sharp paring knife and cut straight down between the main plant and the new crown, making sure that you have a nice root structure attached to the new crown. Plant the new violet in a 4" pot using the instructions above. If your violet leaves have long stems and are hanging over the edges of the pot, you can support them by taking a flat, Styrofoam plate, turning it upside down, slicing to the center and cutting a circle out of the center to allow for the crown, then gently slip it under the leaves. Never pour water directly over the violet. Always water the soil from the side of the pot or by soaking the plant from the bottom. If you have allowed your plants to become completely dry, bottom soaking is the best way to evenly moisten the entire soil ball. Remove spent blossoms and dead leaves promptly to avoid fungus.